and we have no choice but to follow it." These are words from a speech in 1963 by United States President John F. Kennedy declaring NASA‟s commitment to putting a man on the moon and returning him safely to earth. President Kennedy was drawing on a story by the prolific Irish writer (and former librarian) Frank O‟Connor. 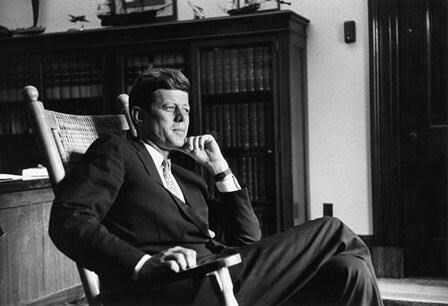 Image courtesy of JFK Presidential Library and Museum. Kennedy described how the young O‟Connor and his boyhood friends crossed the countryside until they came to an insurmountable wall. For some extra motivation to help them cross, they would toss their caps over the wall, leaving them with no choice but to follow. By “tossing its cap across the wall” and investing in its space programme all those years ago the US spearheaded the global development and growth in technology which today sees most of the world living in the “Digital Age”. Nowhere is the Digital Age more prevalent than in modern academic libraries. The marriage of traditional library materials to technology has transformed library storage and retrieval systems in ways unimaginable 50 years ago. Recently I received a phone call at the Information Desk, the caller started by saying: “I have an unusual request. I am looking for a poem, I think it is called „Christmas Time in the Penal Days‟ and I think it's by Daniel McAleese.” The caller went on to explain: “It's for someone with Alzheimer's and he tries to recite this poem which he scarcely remembers from his school days and he's frustrated because he can only recall bits of it. It would be great if we could find the poem for him so that he could recite it without having to recall it from memory.” I took the caller's contact details and started to search. Firstly I googled the title but no joy. I then decided to search the Dictionary of Irish Biography for Daniel McAleese – BINGO! McAleese, Daniel (1833–1900), journalist, poet, newspaper proprietor, and politician. The dictionary stated that much of McAleese's work was published in the Dundalk Democrat and the Nation newspapers. 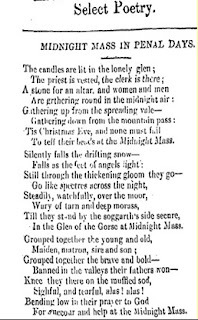 So my next port of call was the Irish Newspaper Archive; starting with the Dundalk Democrat I carried out a keyword search for [christmas penal days daniel mcaleese] in the “Any of these words” search box between the date range 1860 – 1890. To my delight I struck pay dirt with record no.5 from the results list. 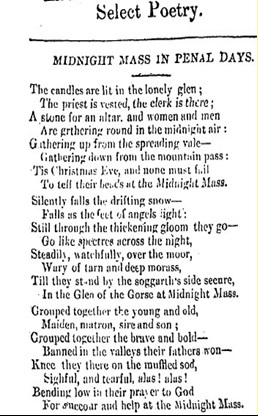 A poem entitled Midnight Mass In Penal Days appeared on page 6 of the Dundalk Democrat in the Saturday 27th February 1869 edition. The title didn't exactly match and the author wasn't specified but on reading the poem I felt that it might just be the right one. Using the excellent „Crop Selection as PDF‟ function from the database's toolbar, I was quickly and easily able to extract the poem from the “Newspaper” and I sent it on to the caller. The response was wonderful. It was the poem they were looking for and “you should have seen the look of delight when he started to read the poem, you're a star and thanks so much” said the grateful caller. "...the combination of digitised artifacts, powerful search engines and online databases"
Feeling good that I had helped someone troubled by Alzheimer's to find some bit of comfort was satisfying but it struck me that it would have been almost impossible without the combination of digitised artifacts, powerful search engines and online databases all of which are largely taken for granted today. These technologies offer potential for expanding our searching capabilities while simultaneously providing fast and precise results. Who knows what the future holds as new technology emerges and is applied to library services. The Glucksman Library may be taking the lead. A new library extension is underway which will house the first automated book repository and retrieval system in Europe. The BookBot is coming to UL and heralds the ultimate marriage of technology and traditional Book material. 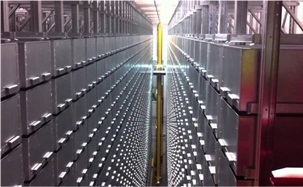 Based on a system already operational in the Hunt Library at North Carolina State University, USA, the robotic BookBot can, according to the Hunt Library website “store up to two million items in a climate-controlled environment and deliver any of them within five minutes of a click in an online catalogue. Requiring one ninth of the space of conventional shelving, the BookBot helps transform a 21st century library from a storage facility into a rich environment of learning and collaborative spaces.” These are exciting times for us as we endeavour to take our library into the future and you could say that the Glucksman Library has “tossed its cap” into the BookBot and we can't wait to retrieve it! Great blog; heartwarming, hopeful and with an eye on both future and past.